Our pals at Apartment Therapy figured out that you can't make whipped cream in a French press this week. Duh. In yet another sterling example of why a working knowledge of chemistry will set you free, had the brave experimenter paid attention he or she would have known that whipped cream is milk fat mixed with air. Whipped cream needs to have at least 80% of its volume made up of air and there's no way something that works as a plunger can get that much air into a liquid. The need for air thing is the reason you can't make whipped cream in a blender either. 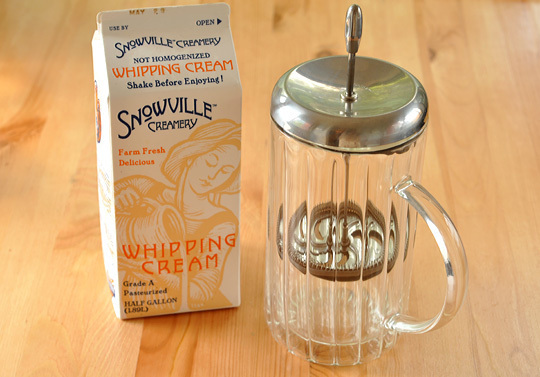 Short cuts abound but I find the best way to make whipped cream is to make it the way my grandmother did, with a bowl and a wire whisk. 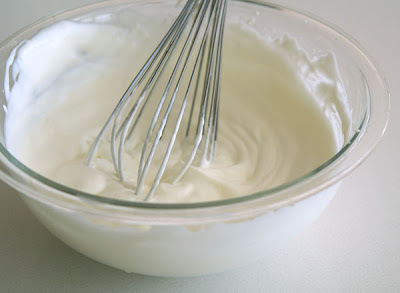 Making whipped cream by hand can be quite a work out but I find that when I have to work at something like this, I am more in touch with what I'm eating and I also eat less of something when I know how much labor went into it. 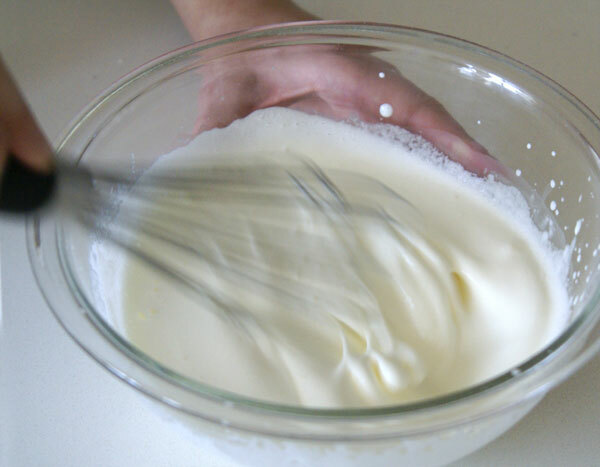 Take a glass or stainless steel mixing bowl and a wire whisk and put them in the freezer for about an hour. Once they're chilled, take a cup of cold, heavy cream and a tablespoon or two of powdered sugar and add them to the bowl. Put the bowl in the crook of your arm and commence to whisking. You can also set the bowl down on a table or counter but I find I have more control if I hold the bowl against myself with my left arm. Whisk for about ten minutes. Nothing will happen for about the first half of that time but the mixture will slowly thicken. About 9/10ths of the way through the cream and air reach critical mass and the mixture stiffens significantly. You're at the soft peak phase. Soft peak is what you want if you're going to add your whipped cream to another recipe. you have about another minute to go. Photos from Pastry Pal. If you're making a dessert topping keep going for about another minute and your whipped cream will reach the consistency of the whipped cream that comes out of a can of Redi-Whip. Stop immediately. If you keep whisking, the fat globules in the whipped cream will begin to stick together instead of the air bubbles you just worked into the mix. When that happens, the mixture separates into butter and butter milk. That in itself is pretty cool but probably not what you're after. 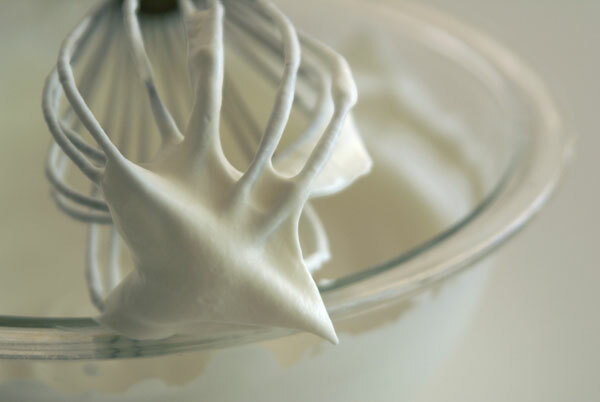 Congratulations, you just made whipped cream. You want a low-fat version of this? Eat a teaspoon of it instead of a quart. Meringue? Now where'd I put my cream of tartar? Do you use a copper bowl when you make meringue? I've never tried it but my sources tell me that egg whites whip better in a copper bowl. oh Paul. You train for marathons(! ), you whip your cream by hand, you make puff pastry, you design and install beautiful kitchens (six projects in construction at once! ), you blog and twitter daily and quarter-hourly, you teach sketchup, you vacation to the Bahamas and Italy. Sometimes. I get bored easily, what can I say? Stainless steel works fine. I've even used ceramic. I just like good fresh eggs. The first thing my Grandmother taught me was how to make lemon meringue pie. The first thing my GRANDFATHER taught me was how to bake bread. You never cease to amaze me with your wide range of interests and knowledge. Opera and knows how to make whipped cream. You are a well lived person. Your grandfather sounds like a man after my own heart. I had to teach myself to bake bread. At first, when I was going through my Google reader and saw your entry I was like "Wha? Huh?". Then I popped over here and received a wonderful cooking lesson. That's why I love KaRD! P.S. I'm lobbying to have that blog's name changed to A-tard-ment Therapy. Thanks Raina, you got a cooking lesson and a low-fat version at the same time. Hah! I love your name for that site. Irritating though they be, if they ever stop being so A-tarded I won't have anything to write about. Ha! I read that same article the other day, and thought to myself, "Where is the video on THAT one?" I would pay to see that. Next up on Apartment Therapy: How to Make Jello in Your Toaster, and Cleaning Your Bathtub With Ammonia and Bleach! Hah! Cleaning your bathtub with ammonia and bleach? Ewwww, they're chemicals, unlike salt and grapefruit... never mind. Thanks, I never realized that. I always make it immediately before i use it. How long will it hold its shape sans sugar?